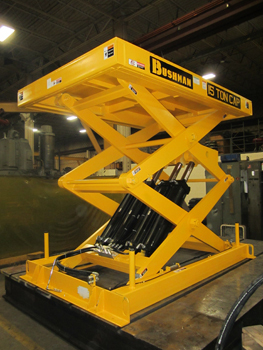 Bushman specializes in building large, high capacity scissor lift tables and jack-screw lift platforms for many different applications. Our scissors lift table and screw lifts are built with welded steel construction, using certified welders in compliance with AWS D1.1 and to meet or exceed ANSI Standard MH29.1, “Industrial Scissor Lifts Safety Requirements”. Structural members, including frames, scissor arms, push blocks, and roller channels, are fabricated from high section modulus steel to provide exceptional stiffness and strength. 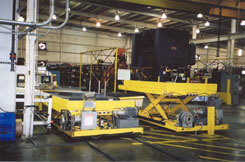 Top and bottom channel rollers are captured to minimize deflection and maintain rigidity. 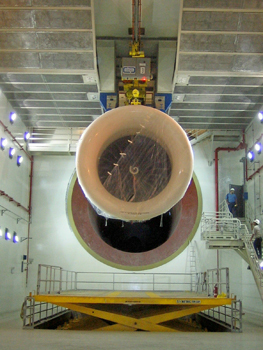 A locking pin is provided to secure the legs in an open position for safety during maintenance procedures. This coil discharge hydraulic scissor lift table features a hydraulically operated top platform that lifts, lowers and discharges coils to one side. This scissor lift table was designed for applications that require a low collapsed height and high weight capacity. The model STX scissor lift table uses a cam-roller assembly that is mounted on displacement-type hydraulic cylinders to open the scissor arms. The STX-SCR industrial lift table uses a mechanical screw, driven by an electric gear motor to raise and lower the platform. This table is designed for applications where hydraulics cannot be used or for extremely precise load positioning. 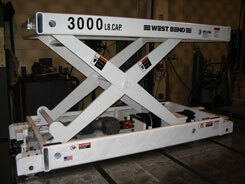 This heavy-duty, mechanical screw-actuated scissor lift table has a capacity of 1,500 pounds. 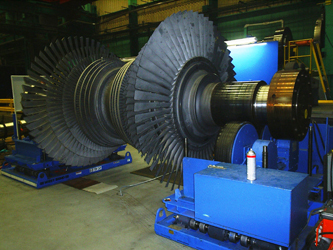 It uses a screw shaft driven by an electrical gear motor. 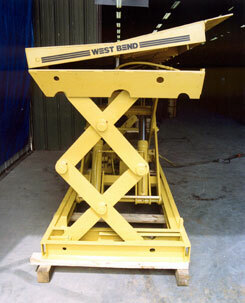 Top and base frame fabricated from welded steel tube, channel and plate. Greasable or oil impregnated bushings. Captured top and bottom channel rollers. Internal or external mounted hydraulic power units. 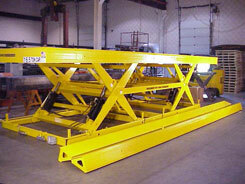 These 15,000-pound capacity traveling scissor lift tables are rail mounted. 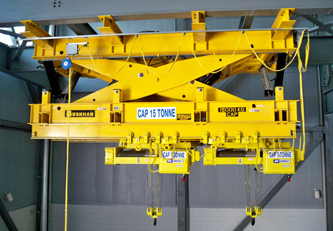 They provide an ergonomic solution for feeding material in a steel blanking facility. 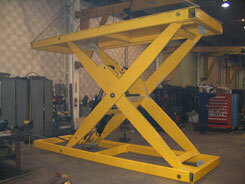 The scissor function permits the platform to index down as the stack height builds. This 30,000 lb capacity double-high hydraulic scissor lift table allows extended vertical travel with a compact platform length. It is ideal for applications such as sheet-stacking and transferring materials between different levels in a building. This double-hgih hydraulic scissor lift work platform has extendable platform slats, each interlocked with a safety limit switch. For applications requiring greater height extension, the model STXXXS scissor lift platform provides a very flexible solution. 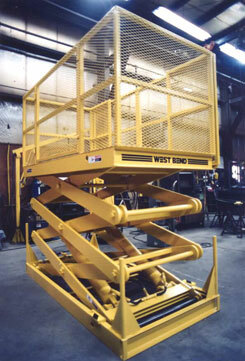 This lift platform can be equipped with railings and other options so that it can serve as a personnel lift. 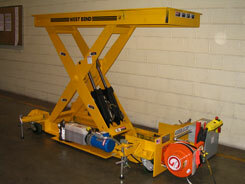 It is frequently used as a cost-effective alternative to dedicated freight elevators. 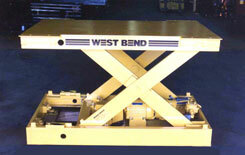 The model DSTXS-L scissor lift table has a mechanical equalizer bar. 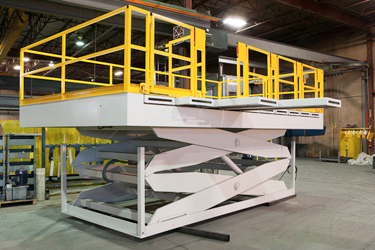 This bar transfers load weight between the scissor sections, allowing unevenly loaded tables to be raised and lowered smoothly. It is an excellent choice for applications that require handling an extremely long load, such as gypsum wallboard, plywood or sheet steel. 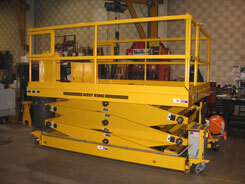 This custom triple high scissor lift is portable and can be towed to different locations within a plant. 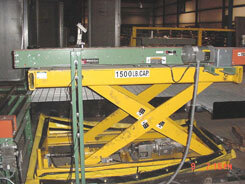 This is a 15 metric ton ceiling mounted scissor lift in a jet engine maintenance training facility. A nuclear waste processing facility in Washington State ordered some highly engineered equipment including a 9,000-pound capacity lift cart and three 4,000-pound capacity scissor lift extraction carts. 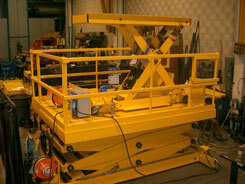 This 12,000-pound capacity scissor lift table platform is 23’ x 44’ and is used in a commercial jet engine test cell. This pair of jack-screw lifts allows quick setup of electric generator tubine shaft assemblies. One lift is fixed and the other is movable along the floor on air-bearings. 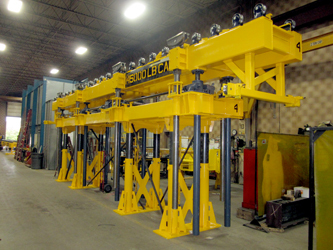 This 145,000 lb capacity ball-screw lift is pit mounted to handle large heat transfer units. Total vertical travel is 8 ft.